The extraordinary thing about the Intel Skylake (6xxx) generation of CPUs are the changes in power management. As I’ve noted before, much of the real-time power management is moved to the hardware, making it much more efficient. When the OS was responsible for managing core parking, it just couldn’t do it well enough, hence utilities like ParkControl. Another change from prior generations is just how large the gap is between the Base CPU Frequency and the TurboBoost CPU Frequency. 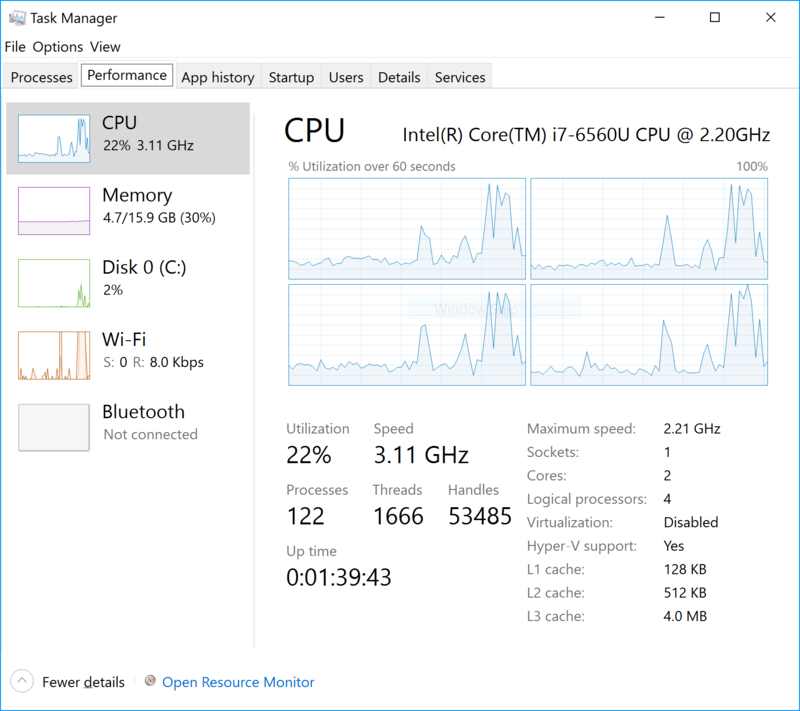 You can see the large (~30%) disparity in the screenshot of the Windows Task Manager attached to this post (spec figures here – 2.2ghz base, 3.2ghz boost). And it seems in testing that even during moderate loads, TurboBoost remains active, so long as thermal conditions allow. TL;DR; Intel has pushed thermal management to a new level with this generation, and has done a reasonable job, though you sure can hear those fans (on a mobile device) ‘gear up’.